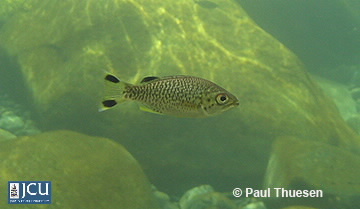 The body of this fish is olive-brown on the upper side becoming silvery on the underside, it is speckled with rusty brown spots. The tail has conspicuous black spots towards the end of each caudal tail lobe, in older fish this may be fused to form a vertical bar. The preferred habitat is flowing freshwater streams and creeks associated with rainforest. They need an intact riparian zone and natural access to saltwater for breeding.